Trellises are both a practical and aesthetically pleasing addition to any garden site. Almost all trailing flower, fruit or vegetable plants can be trained to a sturdy trellis structure to save space. Vertical growing allows air and sunlight to penetrate plants and reduces weeding and plant maintenance. There are a wide variety of trellis styles to choose from depending on what you are growing and the look you are trying to achieve. Trellises can be store-bought or made from many different materials that are easily attainable. Flat trellises are one-dimensional structures that are well suited for training a variety of garden plants. They can be freestanding or easily attached to a fence or a wall. Generally made from wood, metal or plastic, these trellises are commonly used for roses and flowering vines. A great design idea is to cover a barren wall or fence with a flat trellis so that you can enjoy flowering plants along an otherwise boring background. Some people use flat trellises on balconies or decks for privacy. The simplest and most cost efficient way to make a flat trellis is to buy piece of wooden or plastic lattice and attach it to your fence, raised bed, or wall. If you want your trellis to be freestanding, you can use narrow pieces of wood to create a ladder-type trellis that can be inserted into the ground. The size and type of wood that you use should be in line with the weight of the plant you wish to support. Great for an entranceway to your garden or transition point, arched trellises are elegant and usually designed to support a great deal of weight. Perfect for plants such as wisteria, climbing roses or other heavy flowering vines, arched trellises are available in a wide variety of styles and can help you to display a beautiful flowering plant as a focal point. Arched trellises can be made from wood, metal, PVC or even wire. 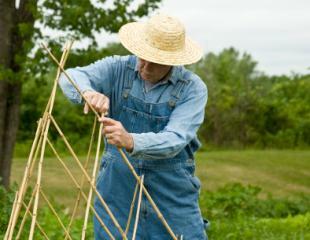 A simple arched trellis can be made at home using a cattle panel and four pieces of rebar. Simply bend the cattle panel in the middle and attach the ends to the rebar stakes. Insert the stakes in the ground and plant your flowering vines at either end of the panel. Fast growing vines will cover the structure in no time. Primarily used for vegetables, an A-frame trellis is a great way to support peas, tomatoes, beans or other vining plants. Most A-frame trellises are built from scratch and use a hinged or simple frame and netting technique. These trellises are easily adjusted to fit inside raised beds and provide the perfect support for vegetables. Also called a pyramid trellis or tuteur trellis, obelisk trellises are a hallmark of a cottage style garden. These trellises have been used for centuries throughout Europe and are known for their beautiful shape and ability to support a wide variety of climbers. If you want a truly decorative feature in your garden, this is the best trellis style to choose. Often made from metal, these trellises range in size from very small to extremely large. There are numerous plans online to make a simple pyramid trellis for a faction of the cost of a retail version. If you are looking for something unique in your garden, consider one of these up-cycling projects. This is a great way to make us of items headed for the landfill and add personality to your garden. Take the panes out of an old window frame and attach some support stakes. Repurpose an old wooden ladder or chair. Use a section of old fencing that has served its time. Set the metal frame of an umbrella in a planter to create a canopy effect. 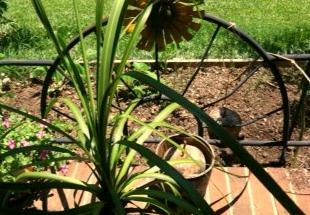 Remember that although a trellis is an aesthetic feature, it must also be functional. Choose a trellis style that is appropriate for the size and weight of the plant you wish to grow, whether it's vegetables in a raised bed or flowers near a fountain. Keep your trellis size in proportion to the rest of your garden; you don't want it to overpower the rest of your outdoor space. Keep in mind that your trellis should act as a supportive skeleton for your plant and that once the plant is mature, very little of the trellis will be seen. Consider grouping of trellises of varying heights for an eye-catching focal point. Place trellises at your front door as a way to welcome guests. 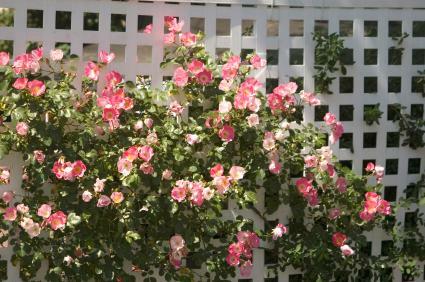 Place a trellis with a beautiful flowering vine behind your mailbox. If you are interested in purchasing a trellis, you can find one in most home and garden centers. There are also a number of online retailers that carry a wide selection of trellises. 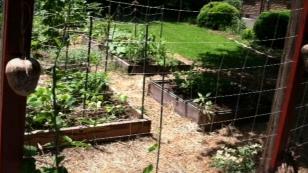 Hayneedle: This site sells a number of high quality trellises and arbors. They feature a number of flat vinyl trellises perfect for adorning an empty wall. Prices range from $49 to over $600, with many options in between. Garden Arches.com: If you are in the market for some beautiful handmade arches, this is just the site for you. This company makes beautiful cedar and copper arches as well as intricate flat trellises. They even sell detailed plans so you can build your own trellis. The cost will vary greatly, depending on what size and style of trellis you desire, with costs running anywhere from as affordable as $50 upwards into the hundreds, depending on your pick. Gardener's Supply: This garden supply site offers a wide assortment of trellises at discount prices. 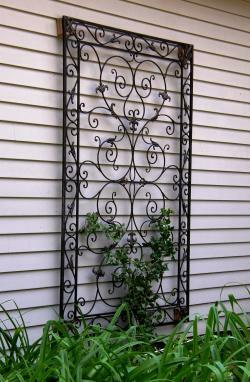 You will find everything from wooden flat arches to unique metal round trellises on this site. Prices are reasonable, with most around $25 to $75, and the products feature useful reviews. Garden.com: This site offers a number of unique trellises that are beautiful in their own right. Choose from interesting shapes such as the "mushroom trellis" or something more traditional like a metal fan trellis. With so many choices, from simple expanding trellises to larger corner trellises, you'll find plenty under $50 with others running over $100. Remember, the sky is the limit when it comes to what can be used as a trellis. Most climbing plants are not finicky about what they climb on as long as you provide the support. Be sure that you know how your plant climbs; some are twining, others are clinging. Some vines need more support and training than others. 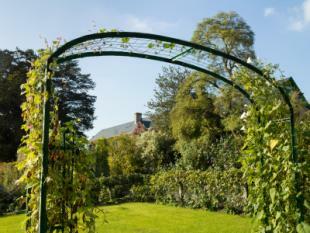 However, with a little care in the beginning, your trellis will soon transform into a glorious living display.